Kayaks come in many shapes and sizes carefully designed to suit the user and their paddling aspirations. Here we look at the basic principles governing the shape, design and construction of kayaks that will help you look at these craft and work out which might be most suitable for your purposes. At the same time we provide links to much more detailed information about those different types of kayak where amongst other things you will find data sheets comparing many manufacturers deigns. Canoes (paddled with a single bladed paddle) are covered on a different page, however many of the basics covered here will apply equally to canoes. 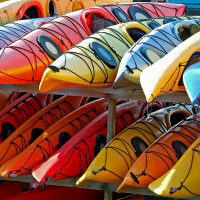 The stability of a kayak is determined primarily by a combination of its width, volume and the shape of its hull. The wider the boat the more stable it will be. Flat water racing boats are very narrow and sitting in one without falling in is a real challenge for the novice. Sit on Top and Fishing Kayaks are pretty wide and very easy boats to keep upright. The volume of a boat is how much water it can displace before it fills up with water or water comes over its deck. If you imagine one person stepping onto a yacht or mid sized motor boat that person's weight makes little difference to the lean of the boat because it has a large volume. 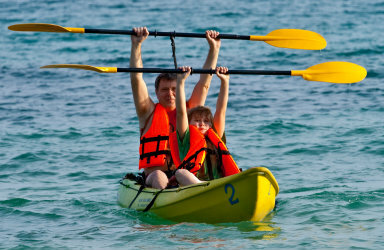 Stepping into or onto a kayak has a much bigger impact and the lower the volume of the kayak the more unstable it will be. The weight of the paddler is also a factor here. The heavier the paddler the bigger volume of boat they will need for a similar level of stability. The shape of the hull has an effect on stability with flatter shapes generally being more stable as seen on Sit on Tops. Rounded hulls or V shapes tend to be more unstable. In the same way that width, volume and hull shape affect stability they also affect speed along with the weight and length of the boat. Strength, fitness and technique of the paddler is another important factor in how fast a boat goes and is covered elsewhere on this site. In determining the speed of a boat width and length are key. At its simplest a longer narrower boat will go faster than a shorter, wider boat. For those of you with a scientific interest the relationship between width and length works together in creating a rule about the wetted surface area. You want the maximum wetted surface area but in addition there is a square relationship between speed and length. An increase in length causes a very big increase in speed. These relationships are well established by boat designers of all types. 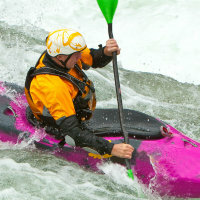 The short fat yellow boat for whitewater, the long thin blue boat for sprint and the white water racer for speed on white water is a blend of both length and width. The lighter your boat the less weight you have to power around and therefore the quicker it will go. Lighter boats are also a lot easier to lift to and from the water, onto roofracks etc. Volume and hull shape certainly affect speed but it is much more difficult to set hard and fast rules. Volume affects speed in terms of how choosing the right size of boat for your weight affects manoeuvrability and your ability to control the boat in different conditions whilst hull shape is a dark art practised by very experienced boat designers. The manoeuvrability of a kayak is primarily determined by length and hull shape whilst light weight boats are always easier to manoeuvre because they require less muscle power generally. The shorter the boat the easier it will be to turn, however this also means the harder it will be to keep it running in a straight line. By contrast long boats run straight with ease but only have very wide turning circles on the move. Many longer boats have rudders that are controlled with the feet to assist with turning. Describing the aspects of hull shape that have most influence on manoeuvrability is a bit tricky. An analogy will help. Imagine a boat shaped like a banana and a boat shaped like a pencil. We would describe the banana shaped boat as having rocker whilst the pencil shaped boat would not have any rocker. Boats with rocker will generally be more manoeuvrable than those without rocker. This is really just an extension of the length factor set out above as the boat with more rocker has less of its length in the water so its waterline length is less than its "out of the water" length. Kayaks come in a number of constructions. The advent of the "plastic" boat has introduced completely new concepts and designs to the market and widened the range and of kayaks available including some very affordable models. The Sit on Top and Whitewater kayak markets are almost entirely comprised of plastic boats sometimes known as "tupperware" boats!. As a material plastic has the advantage of being very resilient, flexing instead of breaking and being capable of being moulded into just about any shape. These boats can be produced at reasonable prices and will last for many years as long as they are not stored in direct sunlight for extended periods of time. Set against this plastic boats tend to be quite heavy. There are two main methods of construction. The older, more widespread and cheaper method is roto-moulding. Here a polyethylene powder is placed in a mould which is spun at high speed to distribute the plastic over the inside then heated to melt the plastic. Once moulded the plastic is cooled and removed from the mould ready for fitting out. The second method if thermoforming. Here sheets of plastic are laid over a mould. In this instance the plastic sheet can be made from a number of layers of plastic with differing properties. The use of acrylic for the outer layer can provide much better resistance to UV and a generally harder more polished finish. Different manufacturers will use different combinations of layers. Boats made this way will tend to be lighter and more expensive than their rotomoulded equivalents. But as they say you generally get what you pay for! Performance boats for competition and at the high performance end of the recreational market are made from a variety of combinations of fibreglass (the most basic), woven glassfibre and a variety of weaves of kevlar and carbon with various honeycomb foams set between the layers to give the desired performance. The particular combination of these materials varies to suit the performance required from the finished boat. Fibreglass and woven glasses are cheaper and suit the lower end of the market whilst kevlar is strong but light whilst carbon adds stiffness. The introduction of a "foam/ honeycomb" layer can produce a light but stiff finish. Different resins used with these materials again give different properties and the use of "Vac Bagging" sucking the resin through the kevlar cloth yields the lightest of boats. 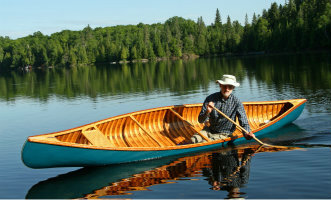 The use of wood as a material for the construction of kayaks is rapidly passing into a historic age. There are still wooden boats around and some keen enthusiasts still love working with and building wooden boats. Many people still swear by wooden seats in their boats made of the most modern construction materials and a top class veneer racing boat will never cease to be a thing of beauty. Designed to cut through waves for journeys along our beautiful coastlines. A stable platform with all the fittings needed for a day away from it all with your rods. 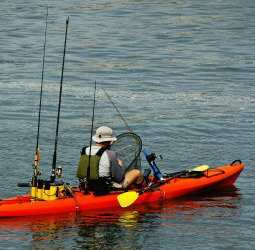 The ultimate portable kayak with a surprisingly wide range of designs and uses. Incredibly stable, great for fun, play, easy touring and more in expert hands. Easy paddling, space for more than just your lunch box. For day trips & longer tours. Versatile boats for playing on waves, bouncing down big rapids and high adventure. The ultimate sea racing craft, punch through surf, catch a wave and head downwind. Pure speed, nothing glides quite like this, high skill factor! 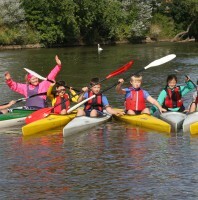 Manoeuvrable like the white water boats but low volume, light and fast, hone your skills to paddle them well. A balance of speed & stability for exhilarating full speed flat out runs down white water. Short for quick turns, soft shapes to avoid damage in this rough tough ball game. Don't let your kids struggle, choose low volume or kids designs.